If you would like a full listing presentation about all that I have to offer, I would be happy to sit down and have a discussion in person. My listing presentation goes into detail about the many unique services that I have to offer, and includes a comparative market analysis that allows us to discuss the proper pricing strategy for your property. It also includes a demo of how many buyers I'm currently working with, and I'll prove to you that I may already have a buyer for your property! As a seller, your relationship with a REALTOR is vital - meet with Todd and ask him about his track record and knowledge of the Muskokas and more importantly, Lake Joseph. 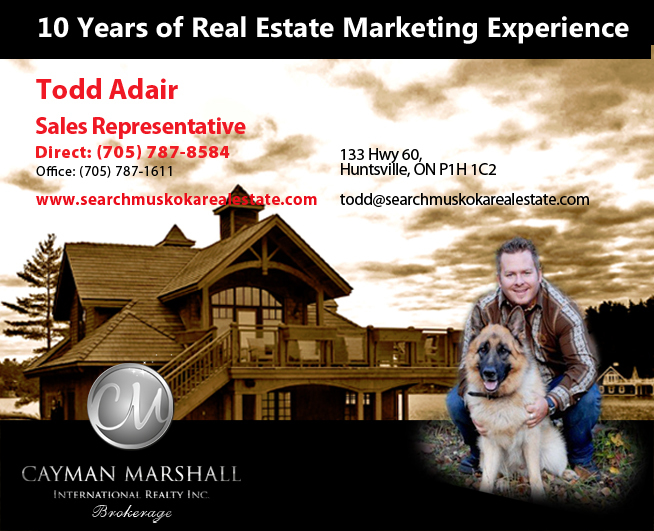 Todd will make you feel comfortable selling your home/cottage and will handle the sale of your home as if it were his own. When you are selling your current property, the relationship you develop with your realtor is very important. Call Todd and ask him about his knowledge of Lake Joseph and the surrounding area. He will be sure to make you feel comfortable selling you property because he will treat it as though it were one of his own. Please be patient, do not close the window.